Nola says to boil the meat or fish. It is more common to gently fry it and if it is meat it is ground first. Today, onions, a garlic clove, tomatoes and bell peppers are added but latter are new world products. Nola, on the other hand, instructs that meat should be cut into pieces as large as two fingers or smaller. instead of being ground. Season it with the herbs and spices. Let cool. Place 1 tbsp of meat or fish in the center of each piece of pastry. Fold it over and seal the edges shut using the prongs of a fork. Make a vent hole in top for the turnover to breath. Otherwise, it will explode in the oven. Place the turnovers on a baking sheet and bake them. They take about 15 minutes to bake. Beat the egg with the juice. A little before done, remove the turnovers from the oven and pour 1 ½ tsp of the egg mixture into each turnover through the vent hole in the top. Put the turnovers back into the oven and recite the Lord’s Prayer and a Hail Mary. When finished remove the turnovers from the oven and serve. They can be served for lunch or dinner with a salad or a rice dish. If serving as hors d'oeuvres, smaller turnover pastries are recommended. NOW I find where the New World (Chile and Argentina) turnovers come from!! They come directly from the Old World! In fact, while in Spain, as you point, turnovers contains pepper and tomatoes, in Chile, Argentina and other Latin American countries they don't, and have some egg inside instead, as in Nola recipe. It is very interesting to find Old World Spanish recipes still used in American countries but which have been forgotten in Spain. 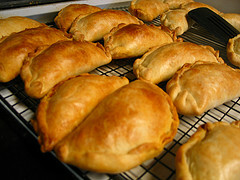 This is ironic - Spain using American products in their recipes for turnovers while Americans are not!